Toddler size (age 2-3) sock. To fit Australian children’s size 12: 16-17cm ankle circumference and 18.5cm long foot (foot length is totally adjustable). It’s easy to size up, the repeat is a multiple of 6. 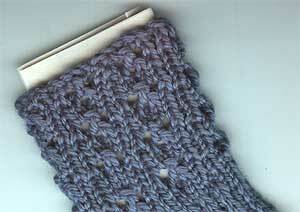 Or if that doesn’t work for you, use 42 sts and add an extra purl to the pattern (i.e., p2, k5). Rows 1, 3, 5, and 6: P1, k5. Repeat until cuff is desired length, 2 – 3 inches. Work heel over 18 sts. I’m going to give flap heel directions, but feel free to use any heel you like. 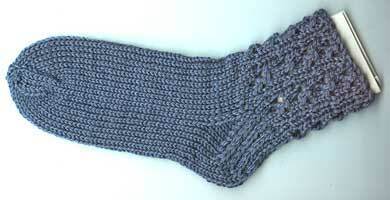 *Slip 1, knit 1* 9 times (18 sts total), turn and slip 1, purl back. Repeat these two rows until 17 rows are worked, ending with a right side row. Purl 9, p2 tog, p1, turn. *Slip 1, k1, k2 tog, k1, turn. Continue in this manner (between *’s, adding one more stitch each time) until all stitches are being worked. 10 sts remain. With the needle in heel, pick up 10 stitches along the right side of the heel. Knit the 18 instep stitches onto 1 needle. With the empty needle, pick up 10 stitches along the left side of the heel and knit 5 stitches off the heel needle. You now have 15, 18, 15 stitches. On the first needle, knit to the last three sts, k 2 tog, k1. On the second needle, work even. On the third needle, k1, ssk, work to end. Work even until the foot is about 1″ less than the total desired length. I like wedge toes, but again, if you want something else, knit something else. First needle: knit to last three sts, k 2 tog, k1. Second needle: k1, ssk, knit to last three sts, k 2 tog, k1. Third needle: k1, ssk, work to end. Repeat until 8 sts remain (2,4,2). Cut yarn, draw through all stitches twice or kitchener toes. Pattern Copyright Diana Cintron dandee@inetone.net. All Rights Reserved. Images Copyright Sarah Bradberry 1999. All rights reserved.